Tired of that Hot Wheels track taking up valuable floor space next to the wall. Get it off the floor and on a shelf. Taking up one whole wall with my Hot Wheels track just wasn't going to cut it anymore. We needed that wall space on the floor for other things. My old track on the floor. So I decided to put my track on a shelf. First I picked up some brackets and a 12 foot board at Home Depot. Next I used a stud finder to mark where the studs were. I wanted to screw the brackets into the studs to help support the weight. I wasn't planning on the track being too heavy, but wanted the option of adding heavier parts in the future if I so desired. They do make some pretty tough anchors that you can just put in the drywall though if you don't want to try to find the studs. Once I found the studs, I marked out a straight line using a level. Once that I had the line across the whole wall, I screwed in the brackets. Because of the way that the holes were in the bracket, I chose to match up the bottom hole in the bracket with my line to keep all the brackets level. Once I got all the brackets up all I had to do was set the board on them and voila! A new shelf. To keep the track straight I am using a 3.5 inch board with 1/4 inch square dowels glued to the edge. I discuss this method more in depth in my Ultimate Guide to Building a Hot Wheels Track. I hung a different kind of shelf bracket on the start end of the shelf that is adjustable for the ramp or drop part of the track. I decided to do this so that I could easily adjust the height of the start. I decided to build a drop down start gate for this track. It's a real easy build. Screw a small piece of wood down to the track. Connect another piece with a hinge. In the second piece, drill two holes just big enough for a small piece of dowel stick to fit in. The hardest part is cutting holes for the dowels to stick up through the track, which really isn't too difficult. I use magnets to keep the gate up and a little metal bracket to use as a handle to push it down. 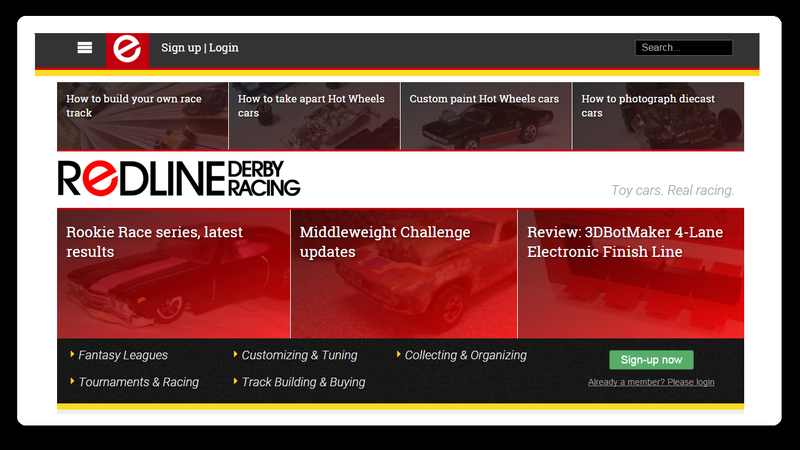 One reason I like the drop down start gate is that you can see the cars well at the starting line. To make the track look a bit more exciting I printed out some racing "sponsor" stickers and put them on a few long thin pieces of wood. Then I used screws to secure them to the wall side of the track. It turned out pretty cool! Next I found some cool tape that looked like a roadway and laid it down on the rest of the shelf. It turned out looking pretty sharp! The finish gate I'm using for this track is a pretty nice electronic one you can pick up here. The last thing I did was pick up a little molding from Home Depot to put on the front of the shelf. It did two things. First it made the shelf look a little nicer by giving it that finished look. Second, it provided a lip to help keep the extra cars on the "road" from falling off the shelf. Well, that's it. It turned out pretty sweet I think. 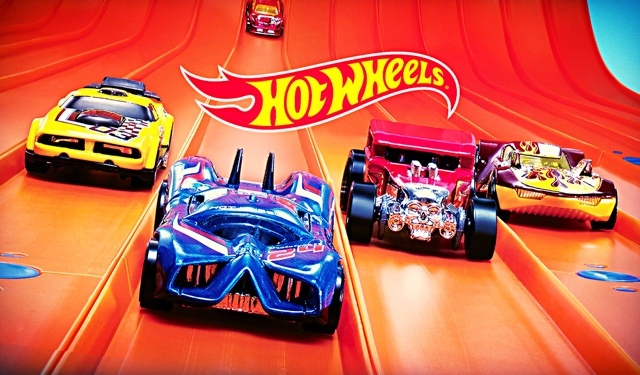 If you'd like to see it in action, check out our Hot Wheels Fantasy Pick'em game. I've been racing cars each week on the shelf track for that and it's been awesome! i love this. is the orange track from homedepot as well? where did you find the track tape? pls add link! thnx! Nice build btw - I love anything creative in 1:64 scale and have been enjoying model making for years but find that it's the little details and finishing touches that make all the difference. Using designs like Red Bull Racing or Gulf Livery is always a winner but if you want something a little more generic that looks good on everything from import cars to old school muscle and Hot Rods then you cannot go past Flame Decals for Cars - with styles available to suit every taste...and every build.